Teeth are used hundreds if not thousands of times per day to chew all types of food. This type of use, combined with dental decay and the resulting fillings, can lead a tooth to significantly break down. While minor break down of a tooth can often be fixed with a filling, often times a crown (also referred to as a “dental cap”) is needed. Photo of a tooth that needed a crown. Patient was from West Haven, CT. Without treatment, the tooth will likely fracture, possibly beyond saving. Photo by Dr. Nicholas Calcaterra. Your tooth is broken or has a very large fracture in it. Your teeth has had a root canal procedure done. Your tooth has a very large cavity. Your tooth has a large filling that is failing. Your tooth has a crown that is failing. You desire a cosmetic improvement to the look of a tooth. A dental crown is a strong piece of material that completely covers the tooth. It protects an already weakened tooth from further fracture and wear. In addition, when a cosmetic material is used, the crown provides a significant esthetic improvement to the look of your tooth. There are three major types of crowns: all porcelain, metal ceramic, and all gold. This page talks specifically about metal ceramic crowns (also known as porcelain fused to metal or PFM crowns). Metal Ceramic crowns have been in use for nearly fifty years. They consist of a hard and durable metal layer that completely covers all of the tooth above the gumline. 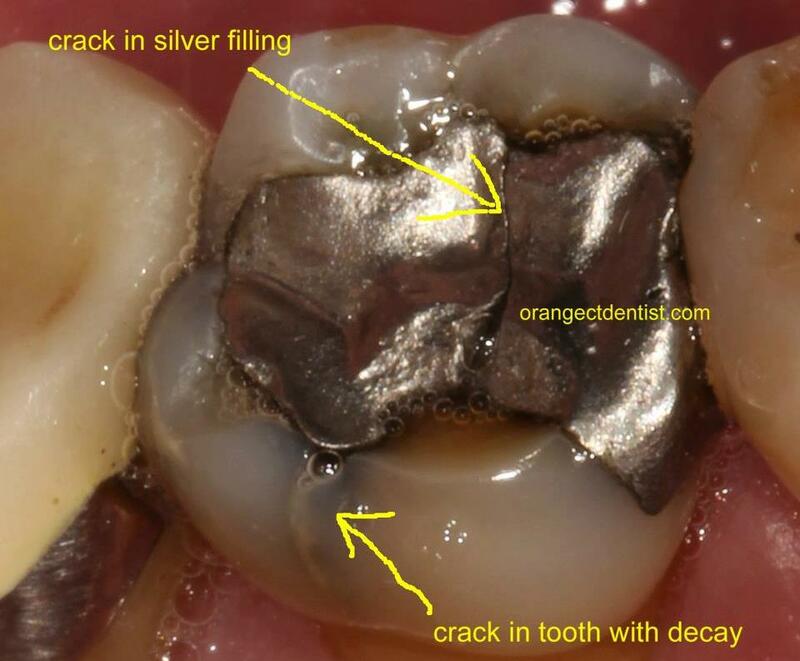 Overlying the metal is a cosmetic layer of porcelain designed to match the adjacent teeth. Their success rates are excellent and we have many patients in our office with metal ceramic crowns that are 20+ years old. Broken upper premolar on a patient from Ansonia, CT. This tooth needed a crown. Photo by Dr. Nicholas Calcaterra. Final crown in place. Notice how it blends in under the gumline. Photo by Dr. Nicholas Calcaterra. The end result for the patient is a tooth restored to normal form and function.